The Kalahari Resorts and Conventions float depicts a scene with an animated 12-foot-wide head of an African elephant gathering with other animals at the watering hole. Inspired by the art of African cultures, such as patterned wood masks, the animals and trees on the float merge into a stylized landscape that showcases both the majesty of Africa and the humans who join together to enjoy a fun and relaxing ride at the lazy river. “The Macy’s Thanksgiving Day Parade is an iconic tradition that brings families together. At Kalahari, we believe that bringing family and friends together in a fun and exciting experience helps strengthen bonds of sharing in the community. 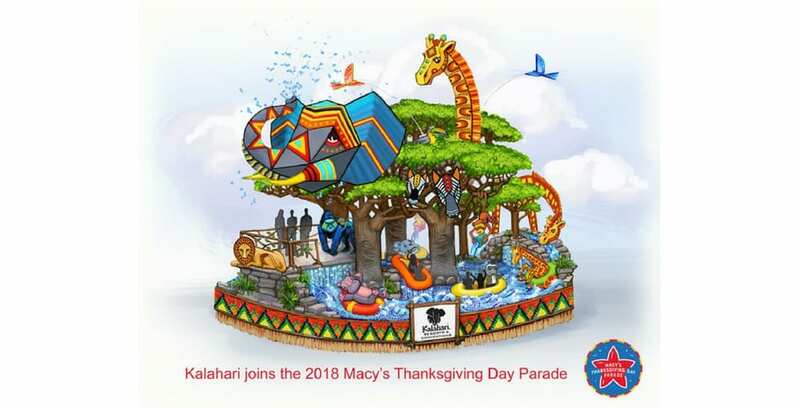 We hope that families across America will enjoy the one-of-a-kind float we’ve created with Macy’s,” said Todd Nelson, owner of Kalahari Resorts and Conventions. For more information on Kalahari Resorts and Conventions, visit KalahariResorts.com.